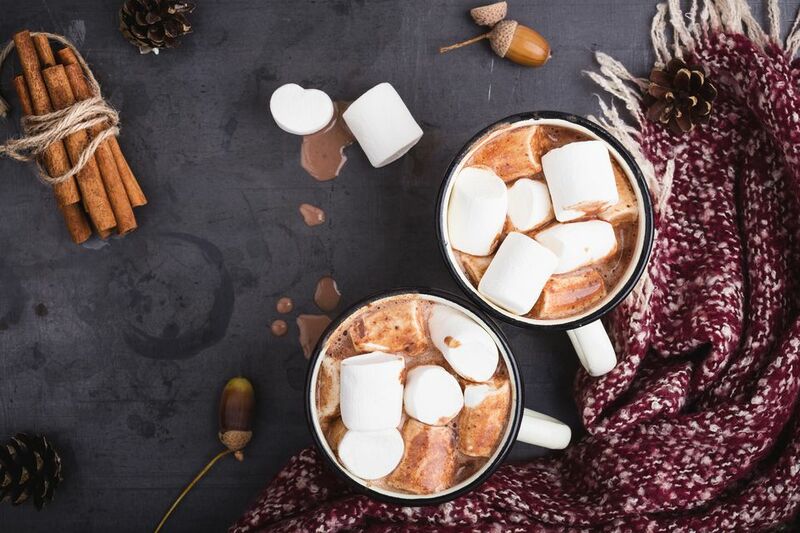 We all know hot chocolate as the warm, rich drink we enjoy on a cold night by the fire, or after engaging in winter activities such as ice skating and skiing. But have you ever thought about this delicious beverage's origins? Hot chocolate's history goes quite a way back, and the drink has changed over the years, evolving from cold and spicy to warm and sweet. As early as 500 BC, the Mayans were drinking chocolate made from ground up cocoa seeds mixed with water, cornmeal, and chili peppers (as well as other ingredients)—a much different version from the hot chocolate we know today. They would mix the drink by pouring it back and forth from a cup to a pot until a thick foam developed, and then enjoy the beverage cold. Although the chocolate drink was available to all classes of people, the wealthy would drink it from large vessels with spouts, which later would be buried along with them. In the early 1500s, the explorer Cortez brought cocoa beans and the chocolate drink-making tools to Europe. Although the drink still remained cold and bitter tasting, it gained popularity and was adopted by the court of King Charles V as well as the Spanish upper class. After its introduction in Spain, the drink began to be served hot, sweetened, and without the chili peppers. The Spanish were very protective of their wonderful new beverage, and it was over a hundred years before news of it began to spread across Europe. When it hit London in the 1700s, chocolate houses (similar to today's coffee shops) became popular and very trendy, even though chocolate was very expensive. In the late 1700s, the president of the Royal College of Physicians, Hans Sloane, brought from Jamaica a recipe for mixing chocolate with milk, which made the drink more palatable in his opinion. Well, others agreed and the English started adding milk to their chocolate; it was then enjoyed as an after-dinner beverage. Up until the 19th century, hot chocolate was used as a treatment for stomach and liver diseases as well as a special drink. Today, however, we simply treat this warm concoction as a beverage to sip and savor. In America, hot chocolate is somewhat thin and often made by combining hot water with packets of powder, although you can find more authentic and gourmet varieties in restaurants and cafes. Other countries have their own versions—Spain's thick chocolate a la taza, spiced chocolate para mesa from Latin America, and Italy's cioccolata calda, which is very thick. Hot chocolate has become so popular in the United States that it is available in coffee vending machines. The powder is sold in packets and canisters, and coffee houses often have rich, somewhat thicker varieties on their menus. It wasn't until the middle of the 18th century that chocolate began to evolve past its drinkable form. First, cocoa powder was invented in Holland, where the Dutch controlled nearly the entire cocoa bean trade. Since the cocoa powder blends much easier with milk or water, it allowed for more creations to come. Next came chocolate as a candy by mixing cocoa butter with sugar and in 1876, milk chocolate was developed. From then on, chocolate has become more popular as a solid treat rather than as the drink it started from.